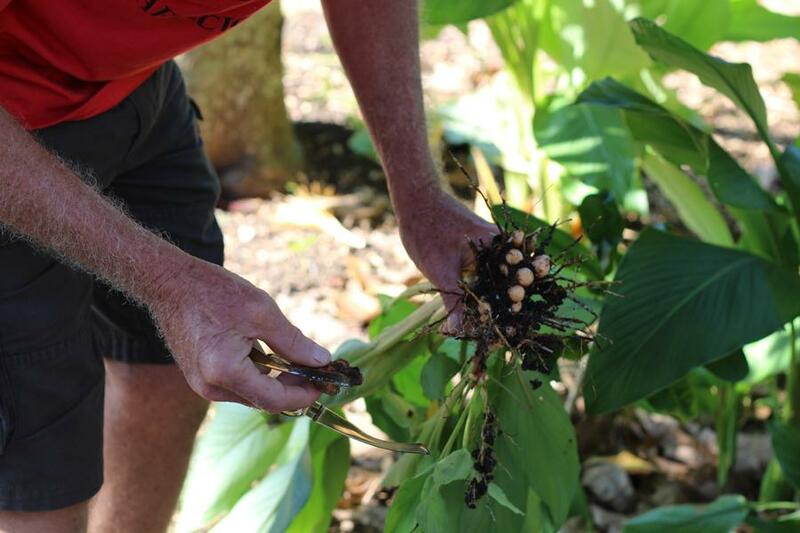 Frank Macaluso pulls up a turmeric root from the front yard of his East Kendall home. He has more traditional raised-bed gardens of greens, carrots, leeks, zucchini and other vegetables in the backyard. Garlic chives mark the edge of Frank Macaluso's front yard. In October, he led a tour of his house for fellow gardening enthusiasts and farmers. Macaluso, a former professor, devotes at least an hour or two a day to keeping out the weeds. 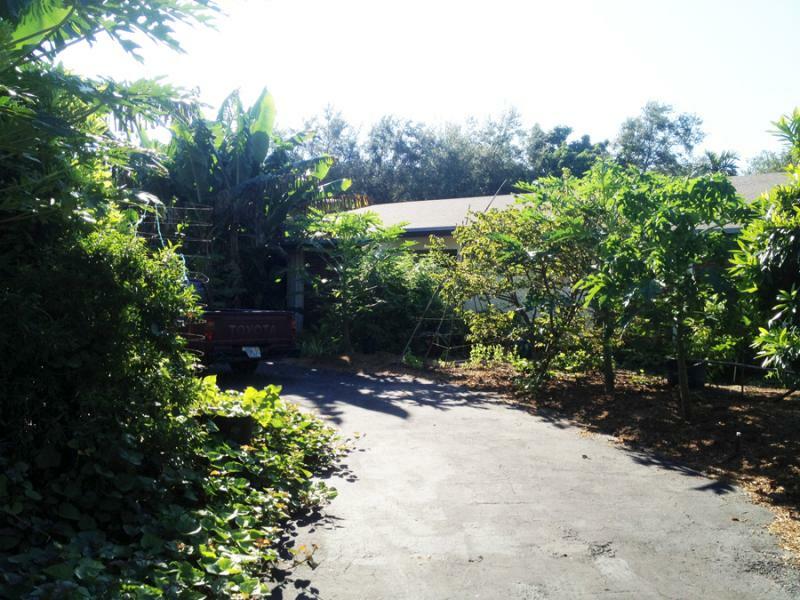 Macaluso's yard may look like a tropical garden gone a little wild, but he's turned his lawn into a garden that provides much of the food he eats. 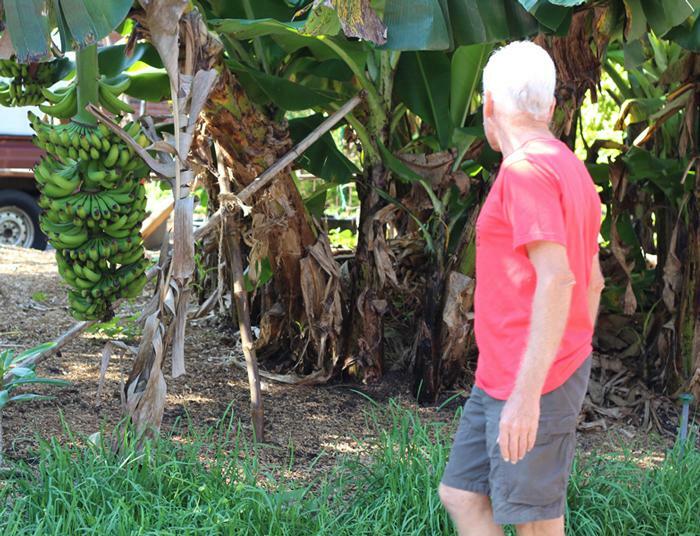 Just along the driveway, Macaluso grows bananas, papayas and Meyer lemons. When Macaluso wants fresh salad, he picks arugula, basil and other herbs from the backyard garden: "It's very convenient. I don't go to Publix too often." The berries of the allspice tree are an ingredient in jerk seasoning. Macaluso also uses the leaves for tea. 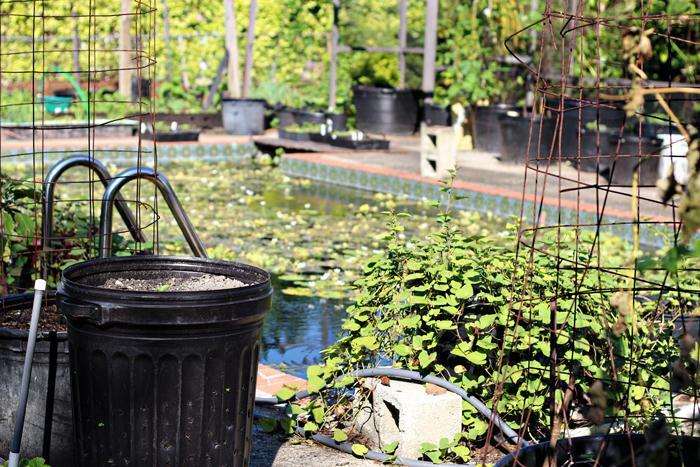 The pool in the backyard is a network of lilies and other water plants: "I just got tired of cleaning the pool." Fish like gambusia and coy live in the pool. Strawberries grow out of the repurposed garbage can. 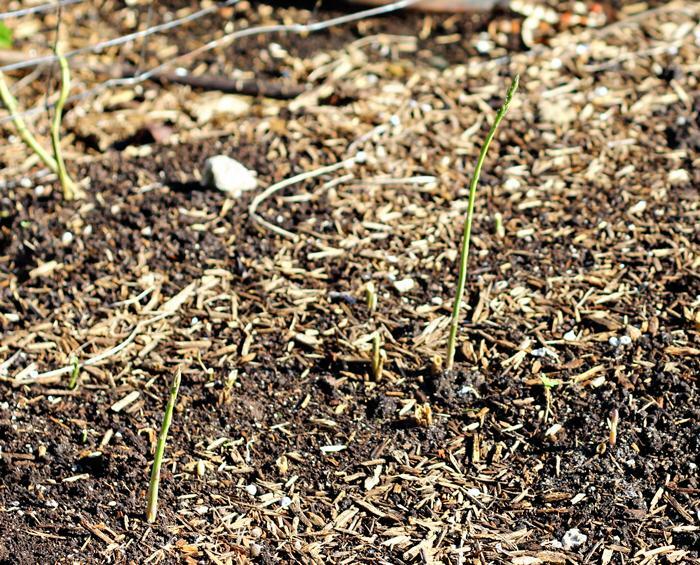 Asparagus shoots in Frank Macaluso's Kendall backyard. 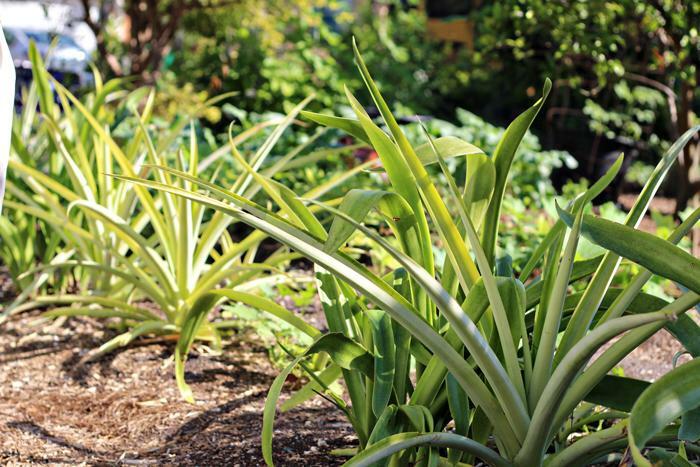 A row of pineapples grows along Frank Macaluso's driveway. The tour focused on regenerative agriculture, an approach to farming and gardening that shuns even the fertilizers and pesticides organic farmers are allowed to use, in favor of planting methods that provide for natural pesticide and weed management and that build healthy, rich soil. Macaluso grows only for his own purposes, but the Earth Learning tour guides, Mario Yanez and Jennifer Garcia Matthews, chose the site to inspire visitors who might want to turn even a section of their lawn into an edible garden. It's a labor intensive yard. Macaluso spends one to two hours weeding each day. ​He is retired after working as an adjunct professor of philosophy at University of Miami and Miami-Dade College. 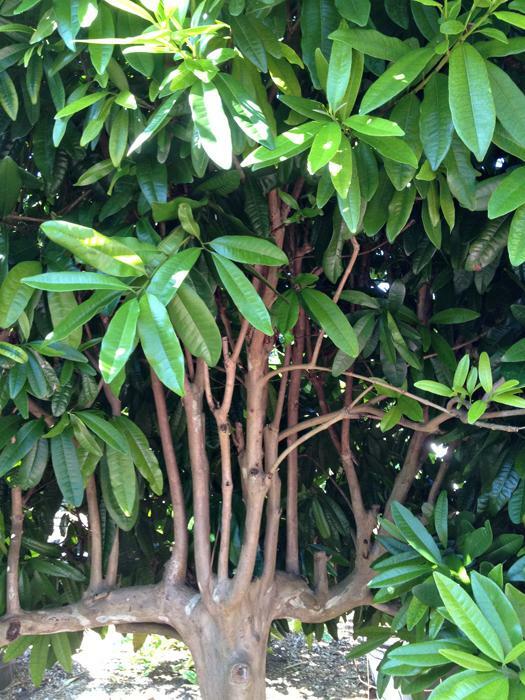 Macaluso plants a wide variety in his dense garden so that he has different foods available in each season. If a plant becomes infested or diseased, there is enough variety in Macaluso's garden that he doesn't lose all of his harvest: "If you plant enough, the bugs get their share and you get yours." Plants and trees in Macaluso's yard include edamame or soybean, arugula, carrots, leeks, broccoli, papaya, mulberry, macadamia, green beans and okra. Sweet potato and garlic chives make up a lot of the ground cover in his front yard. 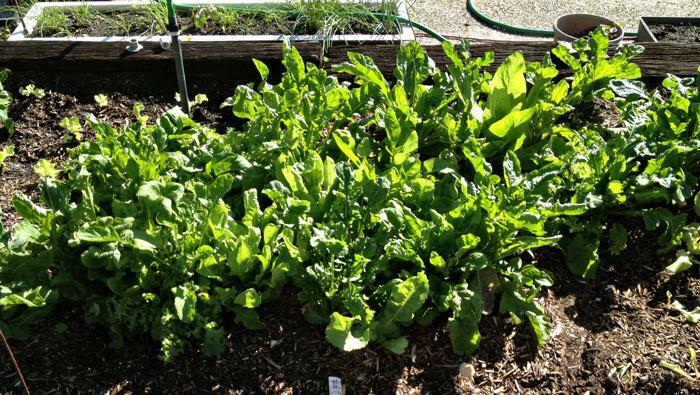 When Macaluso wants fresh salad, he picks arugula, basil and other herbs from the backyard garden: "It's very convenient. I don't go to Publix too often." He says he mostly purchases rice and beans at the grocery store. Read more about another farm on the tour at Miami Dish. This is a guest post from WLRN contributor Trina Sargalski's food and drink blog, Miami Dish. You can also follow her at @MiamiDish on Twitter.